So had you walked by, here is what you would have seen. At a glance, I'll run through and give you some words for all of this from the scenic view, then I hope to get down to nitty gritty and share a slideshow of the fabric collections, patterns, project inspirations and so on in the coming days. Flowers above from my favorite place to buy flowers (and candy) in Houston~ Central Market. This is a new/old couch that belonged to Jeff's grandma. I think she would have liked it like this-trust me. The coverlet on the wall is simply patched squares, turned on point, insulated with one single layer of muslin in the center, backed with more voile and hand tied at the corners of each square (thanks to my mom). Makes a lovely lighter-weight option for warm weather or layered with other snuggly items for cooler weather. In the back ground you see two of the three upcoming new sewing patterns. This is the cozy corner. A poster of Roman +flannel fabric was an easy pull into the booth. And the 3rd of the upcoming sewing patterns~a variation of which I am sure you might recognize if you read here often. And playing a supporting role in the Little Folks collection are the cotton dobby dot prints. You can really see the nubby-fun texture in this photo. The dobby dots are soooo fun and old-timey. They are comprised of four of those "square dance" prints and 8 colors of the "pastry line" stripe. Can't wait to give you the slideshows of all these! 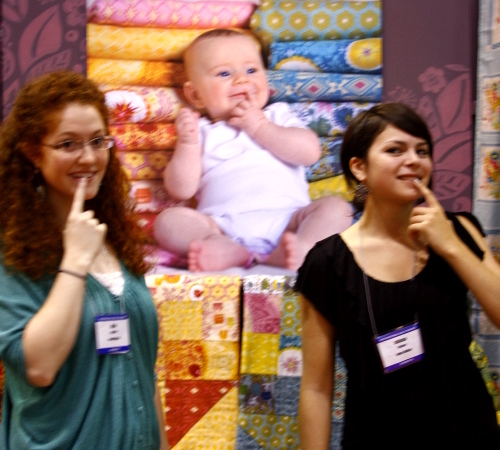 This is me holding a buyer captive and pontificating on the wonders of voile, dobby dot, flannels, and laminates. She agreed with everything. Or maybe she just wanted to leave as quickly as possible and that was the smartest way out. Just nod and say yes, thats what I do when I want out of a conversation. Oh dear. Why do I stand like that? And my faithful employees, Allie and Juliana, trying to be as cute as Roman, which apprarently made me laugh the camera into one shaky blurry photo after another, dernit. OH. Not making me laugh was the charming Brandon Mably trying to flatter Allie's gorgeous locks into modeling for he and Kaffe. They're always looking for redheaded models he told her, blah, blah, blah. Oh he looks nice enough. Those locks are mine, mine! And she is faithful because I pout. And I feed her too. Okay hopefully this makes you feel like you came along a bit. I am really, really so extremely tired once we get the booth up (which isn't even possible without my loving (and strong) husband) and then its a matter of being excited to talk about everything to the point of more exhaustion and never enough good photos, I am afraid. And trust me I do not tire easily, but booths-ahh so tiring. Thank goodness for several online pals who insist upon being really good at reporting! More soon with up close and personal details of the new fabrics and patterns! The flannel poster with Roman is absolutely perfect, precious. Is the other poster of Roman as well? And your showcase area is just splendid and delightful in every way. Thank you for sharing! I can't wait to get my hands on some of that flannel - I love a nice flannel. I love the dress - must get that pattern - I can just see myself wearing on a beach on some exotic resort down south - LOL!!! Oh how I dream! Gorgeous! Your booth is fantastic - I especially love the couch and that brown dress. I can't wait to get the details on all the new fabrics and patterns! Thanks for sharing! I'm really looking forward to the new stuff, especially that flannel. Your booth was absolutely gorgeous! I've been drolling over pictures on other blogs, but it's so nice to see it from your perspective! Looks like you had a wonderful time - I hope Houston treated you well although I bet you're happy to be home! Awesome! Thanks for letting us "virtually" be there! wow... wow!! these are simply amazing.. Thanks for sharing the moments with us!! Thanks for the fun photos! I lock my knees and stand like that too, and it drives my husband batty. I am super excited about the flannel -- I have a bunch of Good Folks waiting to be made into a quilt for my bed, and I've been pondering what I could put on the back that would be soft and snuggly for the winter, but not get boring. I think I just found my answer. Excited about the voile as well -- it looks fabulous to work with. Thanks for sharing your fun photos of the booth. Fabulous looking booth! Eye candy everywhere! Of course, the highlight is the poster of Roman with the wonderful fabrics :). Thanks for your pics, anna.I am mom to 6 too and am amazed at how much you get done. Can't WAIT to start sewing with your new fabrics! It looks beautiful! You certainly thought of all the detials. I love the link and yellow couch. And how cute is Roman? And your daughter is lovely- she looks just like you! The new colors and prints are so beautiful. You are a true artist. What a gorgeous booth! Pure eye candy! Oh my!! I can't wait to start sewing! My brain is FULL of ideas!!! 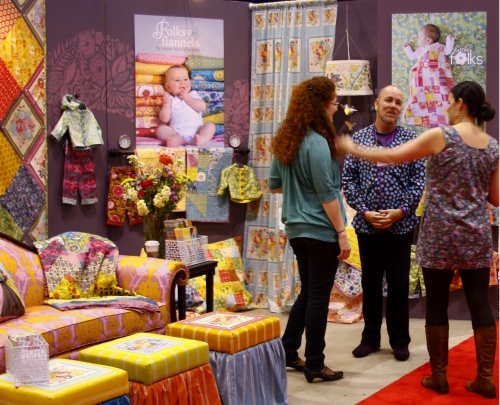 That darling photo of Roman may help draw people into your booth but only coupled with your gorgeous colors, fabrics, and stunning booth. Redheads are awesome! I really impressed! I love it all, but probably the best item is that gorgeous couch! I love it! Just have to chime in to say thank you. This is such a treat and delight to read. All the photos are delicious, even the blurred one. TOO CUTE! Thank you for sharing such a terrific trip around your booth. It did feel like I was there. I can't wait for your you new line of fabrics to be available. They look beautiful, and from I hear they feel wonderful also. I have to know, where is that pattern for the little kids coat and pants? Is that one of the new patterns that you are referring to? Oh my! How do you do it? It looks amazing. I can't wait to get my hot little hands on that fabric! What to make first!? Beautiful and bright! I love it. The blue bag is really interesting and I hope there is a pattern for it. The dress with the gathers and zigzag at the bottom is just my style and I am looking forward to the pattern release. Roman, Allie and Juliana are all hysterically cute. Can't wait to see the flannel fabric in the flesh. Also, love your boots...what make?? WOW, Beautiful.. I want to live in the booth! ha ha... I hope you share with us how to do that twisty turn thing with the pillow you made.. I love it and want several for my sofa! Thanks for sharing.. now get some rest.. you deserve it. You make me laugh so much, Anna Maria! I LOVE to read your blog! (It's on my Favorites.) Icing on the cake that I get to look at such pretty things, too! 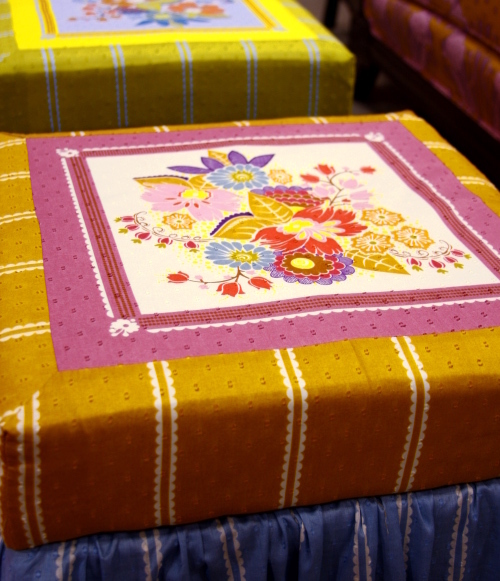 Can't wait to see and touch your beautiful fabrics!! Thank you! Gorgeous booth! I saw a picture of it over at Pink Chalk and was waiting to hear your report. Anxiously awaiting those cotton dobby dots. They remind me of the bedspreads at my grandmother's house. It really is refreshing to see fabric designers try their hands at something besides quilting cottons. I've been waiting for pictures of your booth from yourself..I've seen a few elsewhere on the web but these pics were the best! The fabrics and display are all so beautiful. For someone who had no clue how to even turn on a sewing machine about a year ago...I never knew I could fall so in love with fabric. I can't wait to get some of these. And the pattern for that blue bag..I hope that was one of the items you were referring too. Thanks for the wonderful pics and letting us all get a peek of your booth at the market! Everything looks fabulous - beyond fabulous! Can't wait to get a closer look at your lovely fabrics. All I have to say is - You are Amazing - great look. As to those those dobby dots being old-timesy -give me a break - makes me feel old. Anyway great job. I love all you do. So imspiring for the young - just what is needed. Anna I love your booth. 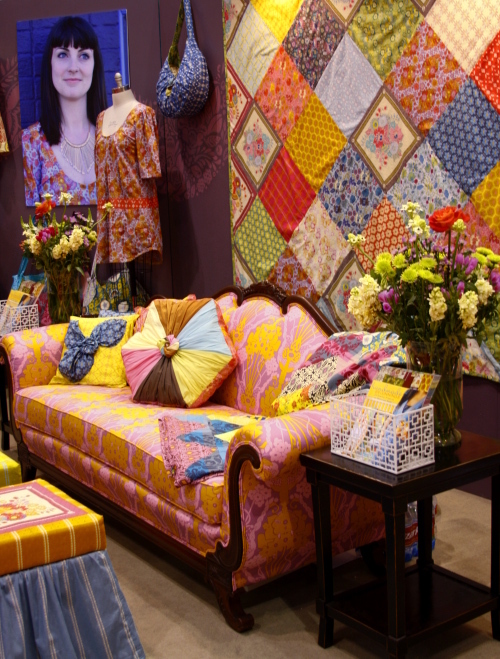 Now I was at the Houston Quilt Show and I don't remember seeing your booth. Was your booth there just for wholesalers or for retail also and I just missed it? I'll be bummed out if I completely missed your booth. I love it! I can't wait until I can get some of it! And flannel? yummy. love it, love it, love it, glad you had a minute to share with us fans. 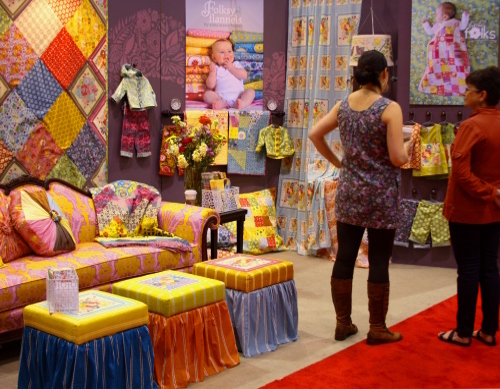 the pictures don't do your booth or fabrics justice! we must have walked past your booth 10 times in two days, my daughter coveting that couch... and trying not to look like we were stalking it. we ordered one of everything and cannot WAIT until your new book comes out with the baby items - we are already planning a "baby shower" event for it when it does! the voiles were like silk and the flannels scrumptious! we never got to speak with you personally but had some good convos with Allie. Loved your boots too!! OH. I am so happy that a pattern for the dress is coming out. I have been waiting for that pattern for A LONG TIME!! I am so pumped. Thank you for making the pattern. What a happy day!! I don't even know what to say, the booth is fabulous and the fabric out of this world. But those children, so beautiful and a 4 more just as sweet and beautiful at home! The fabrics are fabulous and all, but where did you get your boots?! They are so cute. I moved to Nashville this summer and I've been looking for the perfect pair of boots every since. Something nice and tall, more flat than high-heeled, the perfect shade of brown to match any outfit- I must have those boots! :-) And the fabric, I must have the fabric. Please, please, please tell me you have a pattern coming out for the empire waist strapless dress! I wanna be a textile designer when I grow up! I guess until that happens (read: I develop some new kind of talent that I can only DREAM of having! ), I'll just drool over your amazing fabrics - and I need some of the dobby dots! Beautiful! I've been catching glances of your booth around the blogs for days. 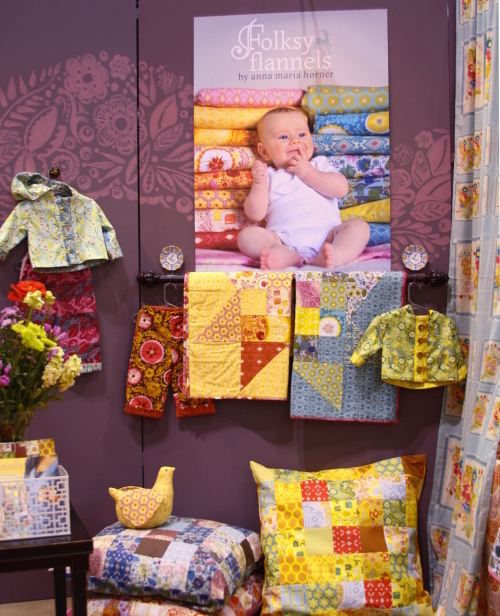 I love your fabrics and the many wonderful ways you've displayed them! WOW! I really need to do some more sewing so I can use up some of my fabric stash therefore justifying buying more! Love how the fabrics have a retro feel. And the dress, gorgeous! Thanks for being so creative, generous and hard working. Thank you for all the photos, lovely colours and splendid booth. Roman of course growing and cute as always but my, in that last photo.. don't you look exactly like your eldest daughter? I thought it was her for a minute! Go on, compare that one to the header photo.. no difference! As usual, Gorgeous Booth, Gorgeous Designer, Gorgeous Children-Great Job, Anna!!! Thank you for letting us "visit" with you on your blog, and travel with you, and soon, sew with the same scrumptious fabrics as you have been handling recently-can't wait to get a hold of that dress pattern-and run with it!!! Please, please, please do a giveaway!!! Thank you so much again, and you look lovely no matter how you stand!! I love the poster of the flannel prints and Roman! WHat a cutie he is! That picture of Roman is just crazy cute!! "I'll take one of everything, please." HOW do you do it? 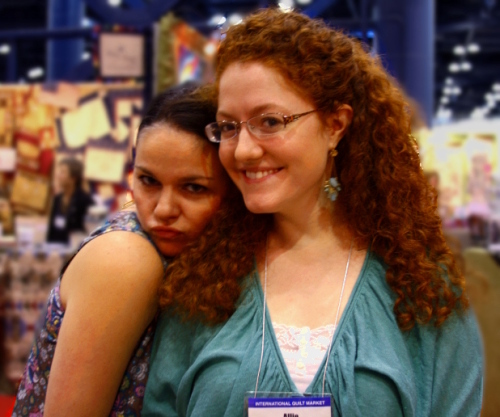 You have a passel of children, yet you write books, make beautiful stuff, (LOTS of beautiful stuff) and have a booth? Are you wonder woman? So many pretty things around here. Your corner of the market (so to speak), looks just lovely. I'll take tea AND hot chocolate whilst I lounge on your sofa and look at yummy fabrics and yummy baby. Flannels? My heart-be-still. Really? THANK YOU. (cause there's nothin' that great out there that I can get my paws on). Can't wait! SO excited for everything. Gorgeous photos as per usual, Anna Maria!!! Congrats on the new collection. Can't wait to sew with it and make my very own floor-length empire waist dress! OMG! you look just like Juliana! ageless. lucky! your booth looks so festive and lively... just BEAUTIFUL! I want to lounge on that couch. Gorgeous booth! I love it all! I LOVE, LOVE, LOVE that couch! Your flannel + Roman poster is precious and I love that brown dress! Above all else, what impresses me the most is that you look like a teenager. Even after all those children. sigh. I am SO excited about that dress pattern! Can't wait! Fabulous photos! I love them so much....plus, I love what you're wearing, did you by any chance make that? I think you are amazing, one day soon I will come to one of the shows in the states. 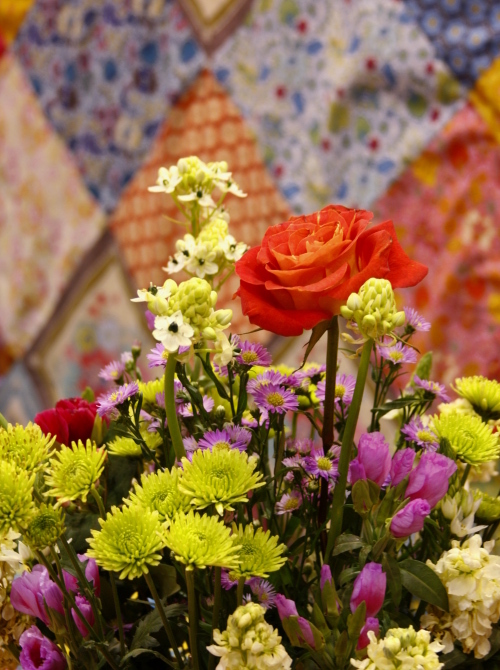 I dabble a bit with patterns and teaching classes as well as longarm quilting and am always interested to read your blog. You are so funny (in the good way) love the posts! Hey Anna, I happen to have two couches in need of recovering that are in close location for spring market (less than 90 miles to Minneapolis) Just in case you were in nned of couches to recover. My favorite is the Charming Twist Pillow! It's beautiful and the pattern is brilliant! 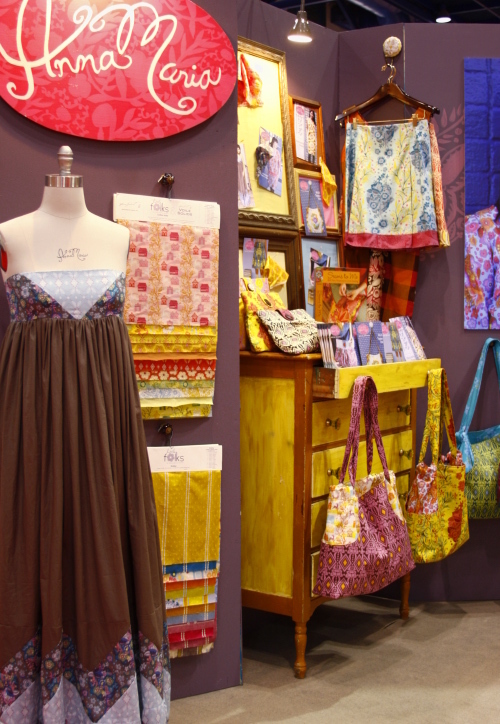 You are such an inspiration, I LOVE sewing with your fabrics, my daughter loves the pretty colors! The strapless empire waist dress is gorgeous, is there a pattern for this??? I just started sewing and would be afraid to try it with out one. I' about to have my second daughter and this would cover the post natal belly really well!!!! Hello, What enticed you to post this article. It was extremely interesting, especially since I was searching for info on this subject last Thursday. Please come visit my site Texas TX Phone Directory when you got time. Hello, What enticed you to post this article. It was extremely interesting, especially since I was searching for info on this subject last Thursday. Please come visit my site El Paso Business Directory Forum Blog Classifieds when you got time. this seems like it would be a very interesting blog to keep up with. Please come visit my site Business Services Web Directory Of Long Beach when you got time. this seems like it would be a very interesting blog to keep up with. Please come visit my site Long Beach Business Directory Resources city guide when you got time. WOW. I have to say that i adore your fabric lines. 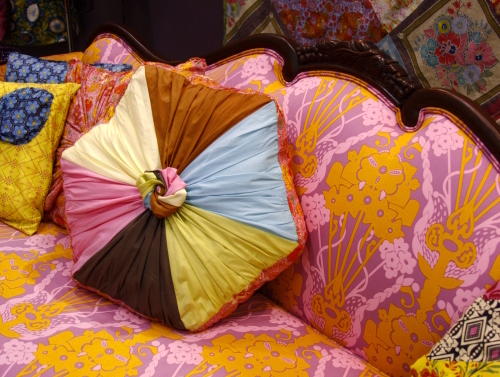 The bold colors and patterns are inspiring. I also love the flannels. It is so nice to be able to get a flannel that dosent have a stupid duck and teddy beare on it. So nice. Thanks for your inspiration and blog. The booth looks amazing! Though I'm not at all surprised. I remember the long, grueling hours at trade shows. Ugh. I always ordered the cushiest carpet padding and soaked my feet. This post is very excellent, because the very informative thanks for sharing. I definitely enjoyed every little bit of it, I have you bookmarked to check out all the new stuff you post. hard was it to build your blog? Could someone like me, a newbie do it? I really wanna to write in my site something like this. Just for your info your home page seem broken when I visiting using FF.lways been freely available from bookshops and dealerships, as well as on the Internet, but the major problem has been that they tend to be pretty expensive. I got some ideas from here! Feel free to visit my blog and suggest things!